Researchers at the University of East Anglia (UEA) have shown that when photons - the fundamental particles of light - are created in pairs, they can emerge from different, rather than the same, location. Quantum entanglement - when particles are linked so closely that what affects one directly affects the other - is widely used in labs in numerous processes from quantum cryptography to quantum teleportation. The UEA team were studying a process called spontaneous parametric down-conversion (SPDC), in which photon beams are passed through a crystal to generate entangled pairs of photons. Prof David Andrews in UEA's School of Chemistry said: "When the emergent pairs equally share the energy of the input, this is known as degenerate down-conversion, or DDC. "Until now, it has been assumed that such paired photons come from the same location. Now, the identification of a new delocalized mechanism shows that each photon pair can be emitted from spatially separated points, introducing a new positional uncertainty of a fundamental quantum origin." The entanglement of the quantum states in each pair has important applications in quantum computing - theoretical computation systems that could potentially process big data problems at incredible speeds - as well as other areas of quantum physics. The findings are also significant because they place limits on spatial resolution. Prof Andrews said: "Everything has a certain quantum 'fuzziness' to it, and photons are not the hard little bullets of light that are popularly imagined." The study 'Nonlocalized generation of correlated photon pairs in degenerate down-conversion' by Kayn A. Forbes, Jack S. Ford, and David L. Andrews is published in the journal Physical Review Letters. A worthy path for research if evidence accumulates. Most interesting! The achievement of optimum conversion efficiency in conventional spontaneous parametric down conversion requires consideration of quantum processes that entail multi-site electrodynamic coupling, actively taking place within the conversion material. The physical mechanism, which operates through virtual photon propagation, provides for photon pairs to be emitted from spatially separated sites of photon interaction; occasionally pairs will be produced in which each photon emerges from a different point in space. The extent of such non-localized generation is influenced by individual variations in both distance and phase correlation. Mathematical analysis of the global contributions from this mechanism provides a quantitative measure for a degree of positional uncertainty in the origin of down-converted emission. Yeah but the two photons still have to combine into one first. There is no spooky entanglement at a distance. It's not really very surprising when you understand a) how photons move through solid, transparent media and b) how uncertainty works. It's a nice piece of theoretical and experimental work, but it's certainly not Earth-shattering. So this is what, some sort of momentum/energy coupling through a crystal lattice to allow the photon to be emitted at a remote location? Or am I way off base? Hey @Axe, haven't seen you in a while. It's pretty obvious that in order for a photon to propagate through a (transparent, has to be) solid, it has to get absorbed and re-emitted multiple times. In an SPDC, there has to be an electron orbital that has to spend some time in a squeezed vacuum state; if it happens that a photon is absorbed by an electron in that orbital *and* in that state, then instead of simply re-emitting the photon which goes on its merry way, it instead emits *two* photons, which conserve energy by each being half the energy of the original one, and conserve momentum (but lose a little bit by imparting some momentum to the solid), and finally conserve angular momentum. This final conservation can happen two ways, one of which produces two photons of the same polarization (Type I SPDC) and the other of which produces two of opposite polarization (Type II). The detail of whether it's a Type I or II depends on the orientation of the orbital with respect to the lattice. It's important to remember that most of the photons are not down-converted; but the ones that are can be separated, not only from the ones that aren't, but from their partners. In addition since both down-converted photons are emitted by the same electron, they have to be correlated on energy, momentum, and spin because of conservation laws. In addition to all that, these correlations and the common origin mean that they are not merely correlated but engangled. That's the conservation part, and the entanglement part. The uncertainty part is, with the energy of the photons so closely constrained by conservation, the time-energy uncertainty relation means that the photons are emitted at uncertain time, i.e. from slightly different locations. It's actually a bit more complicated than that; once absorbed, the original photon can (and generally does) also propagate through the lattice as a phonon and then later get emitted from a different location in the lattice and sometimes as an SPDC pair, and the paper mentions that too, but the essential features are captured in my treatment above. The essential features are conservation, entanglement, and uncertainty; the phonon propagation is a sideshow, but important to the analysis. So it would now seem that we are uncertain about the uncertainty principle. Brilliant! With the fuzzyness in location - with its complementary variable momentum - this should mean that there is a fundamental uncertainty in the frequency of the created photons. I.e. combined with the energy ofthe original photon this is a mechanism for photon-phonon coupling. Or am I totally off? Hi Da Schneib, nice to see you again. I still hang around here, don't worry. What is the quantum efficiency of this down conversion process? It sounds like it would have to be really low. Also, I wonder of the phonon propagation could be minimized by either doing this in a thin film, or perhaps making a monocrystalline sample, where you could do something similar to the Mossbauer effect, where the first excited state is so high that the whole crystal has to recoil. I wonder if the energy/time relation means that the uncertainty in emission location would change with energy? To an extent greater than the usual "detector resolution according to wavelength". My sources indicate you're correct. I don't know; off the top of my head and just guessing, I suspect this requires 3D recoils and I suspect restricting it to 2D in a film will squeeze it out of existence. But stranger things have been done in materials science so I won't tell you you're wrong. Remember that no matter what you do the energy of the two output photons has to be equal to the energy of the original input photon, and with a laser (as is generally used with these SPDCs) the energy is well-known due to coherence, there's not much wriggle room here. You can play games with conservation laws instantaneously, but over the long haul it all has to work out. Not if some is carried away by a phonon. Conservation laws work over the integral of all involved parties. I think it would be interesting to see if the mean in the frequency exactly conforms to the input photon energy (which would mean no photon-phonon coupling) or if it's slightly less. Though for such an experiment an ultra-cold medium would be necessary - otherwise you can also get the opposite reaction where an already present phonon bumps up the photon energy (frequency). Not if some is carried away by a phonon. It can't be if it's a SPDC. From what I gather on SPDC (wikipedia...I know)...there is momentum transfer into the crystal. Shouldn't this lead to a frequency shift in the exiting photons? From what I gather on SPDC (wikipedia...I know)...there is momentum transfer into the crystal. It's not along the line of travel. See the momentum diagram in the article. Shouldn't this lead to a frequency shift in the exiting photons? I couldn't find an experiment where this has been documented. Perhaps you can. It's not clear to me since the momentum shift is transverse that the SPDC process might not, for example, be stealing heat from the BBO crystal. Since it's so inefficient this might not be measurable. Hmmm, you know, I thought about this and since the momentum change is transverse and apparently opposite, there might be cancellation and zero net momentum. It's not along the line of travel. I couldn't find an experiment where this has been documented. @antialias, I'm pretty sure my second post has the solution: the two photons acquire equal but opposite transverse momenta totaling to zero. I'm also not sure the Wikipedia article is right about there needing to be any momentum change in the BBO crystal to add transverse momentum to the two photons. I think that's an analytical error on the part of the Wikipedia author. In addition to pair-formation, it's reverse process is annihilation. This produces two 1/2 Threshold Gammaray energy photons traveling in opposite directions in order to preserve Conservation of Energy. The same process can occur with two opposite but equal charges from the virtual particle field (zero point energy field) to form low energy photons of electro-magnetic energy. Finding a fuzzyness in emission location, seems like it would then also add another squeeze axis available to create more precise better-than-uncertainty measurements.. In addition to pair-formation, it's reverse process is annihilation. This produces two 1/2 Threshold Gammaray energy photons traveling in opposite directions in order to preserve Conservation of Energy. No. The reason why they travel opposite to each other is due to conversation of momentum - not conservation of energy. Any hydrogen atom generates coherent electromagnetic waves when it changes its energy states. No. A change e.g. from a 1s to a 2s orbital for the electron in a hydrogen atom does not produce an electromagnetic wave (it needs to capture a photon to do so). Only when an atom goes from a higher energy state to a lower one does it emit a photon. But 'coherent' is also wrong because that only applies to ensembles of atoms under very specific conditions. Particles? 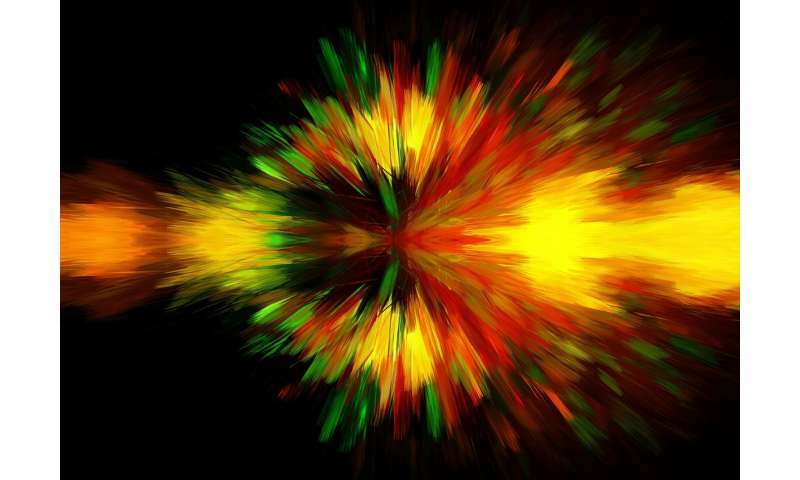 Exactly what is a particle? I help calibrate the tools you may be using, but I'll calibrate my physics upon 1 Truth, there exist a + & - charge! That's it. It's not throwing anything away, it is only updatings its field. You can throw voo doo at it; but this is all ya git! Its field exist everywhere, it's super imposed upon all the rest, never created, never removed. Might as well as look at the many possibilities based upon where you're standing now, within this field. But you put limits on what? Lambda_init/Meas_period! Silly Wabbits! Can't hop around axiom 1: There exist ..
How can you define and existence proof using non-causal theory, apply a little "Maxwell Grease" into a probability distribution; make all measurements based upon what causal event? Charge! It moves a field and a field moves it. So... they're talkin' to each other, now? "grease" is only laziness as to cause. is make all measurements based upon what causal event? the one we're too lazy to find. Charge! It moves a field and a field moves it.